The Palace - 2 FREE Nights - Pay for 5 Nights and Stay 7!! Only 10 reservations available per day on this special! What is better than getting a free night stay during your vacation? *Select accommodations only. No other discounts apply. Excludes groups, packages, holidays and special events. Can not be combined with other offers. Free night will be deducted from lowest rates shown. Minimum night stay does apply. Taxes and fees not included. Other restrictions may apply. Get more bang for your vacation bucks and get TWO FREE NIGHTS!! That's 7 nights of vacation for the price of 5*! Pay for 5 nights at our select rate and enjoy TWO FREE NIGHTS! *Limited availability. Only Oceanfront One Bedroom Suites apply. No other discounts can be used. Excludes groups, packages, holidays, special events, and existing reservations. Can not be combined with other offers. Displayed rates reflect discount. Minimum night stay does apply. Current taxes and fees are not included. Other restrictions may apply. Landmark Resort - 2 FREE Nights - Pay for 5 Nights and Stay 7!! Only 10 reservations available per day on this special, so BOOK NOW! *No other discounts apply. Excludes groups. Cannot be used in conjunction with other packages. Excludes groups and holidays. Limited number of units available. Minimum stay may be required. Other restrictions may apply. Rates will vary based on travel date and occupancy at time of booking. Taxes and fees not included. *Limited availability. Only Oceanfront Guest and Executive Suites or 2-Bedroom Oceanview Condos apply. FOR LONGER STAYS PLEASE CALL 800-222-2141. Forest Dunes - 2 FREE Nights - Pay for 5 Nights and Stay 7!! 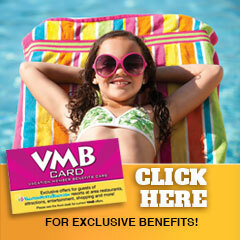 Get more bang for your vacation bucks and GET TWO FREE NIGHTS!!! Pay for 5 nights at our select rate and enjoy TWO FREE NIGHTS. *Limited availability. Only 1-Bedroom Oceanview Suites apply. No other discounts can be used with this offer. Excludes groups, packages, holidays, special events, and existing reservations. Can not be combined with other offers. Displayed rates reflect discount. A minimum night stay does apply. Current taxes and fees are not included. Other restrictions may apply. Only 10 reservations available per day on this special, BOOK NOW! *No other discounts apply. Free night will be deducted from lowest rates shown. Taxes and fees not included. Excludes groups, packages, holidays, special events. Free nights will be deducted from lowest nights shown. Minimum night stay does apply. No refunds for early check-outs. Other restrictions may apply. Hotel Blue - 2 FREE Nights - Pay for 5 Nights and Stay 7! Guests will also receive 1 FREE game of bowling, per day, at our Captain's Quarters building. *No other discounts apply. Free night will be deducted from lowest rates shown. Taxes and fees not included. Excludes groups, packages, holidays, special events. Free nights will be deducted from lowest nights shown. Minimum night stay does apply. Discounts on shoe rental available. Bowling must be used by 7pm. Please check with the front desk regarding lane availability. Other restrictions may apply. Carolina Winds - 2 FREE Nights - Pay for 5 Nights and Stay 7!! *Limited availability. Offer available on Angle Oceanfront Family Suites only. Displayed rates reflect discount. No other discounts apply. Excludes groups, packages, holidays, and special events. Rates are based off current house rates. A minimum night stay is required. No refunds for early check-outs. Current taxes and fees are not included. Other restrictions may apply. Beach Cove Resort - Pay for 5 Nights get 2 nights FREE! *Limited availability. Offer available on Oceanfront One Bedrooms. Displayed rates reflect discount. No other discounts apply. Excludes groups, packages, holidays, and special events. Rates are based off current house rates. A minimum night stay is required. No refunds for early check-outs. Current taxes and resort fees are not included and will be collected at check-in. Other restrictions may apply. *Limited availability. Offer available in select rooms only. Displayed rates reflect discount. No other discounts apply. Excludes groups, packages, holidays, and special events. Rates are based off current house rates. A minimum night stay is required. Current taxes and fees are not included. Other restrictions may apply. Caravelle Resort - Stay 7 Pay for 5 - TWO Free Nights!! Now featuring newly renovated Caravelle Resort building rooms and suites! Ocean Creek - Pay for 5 Nights, Get 2 FREE!